Listings are piling on at a similar pace as last May. Sales will very likely eclipse May 2011. I suspect it could be by as much as 10 per cent, which you know will quickly become the media story: "Sales spike in Victoria." If I was writing the headline, it'd be "Sales volume barely eclipses decade low." The G&M has been running an interesting "blogger" series about buying in Canada for the past month. It's surprisingly decent. The Vancouver couple concluded now's not the time to buy; <sarcasm> which is SHOCKING I tell you! </sarcasm> There's a pretty good collection of resources with a fair amount of perspective balance; a nice change from the "now's always a good time to buy" meme of the recent past. Not much to say here as usual. Sales are running higher than last year, but sales/listings is pretty close. On another topic, one of the most interesting non-Canadian housing blogs is Tim Ellis's Seattlebubble.com. They have a lot more detailed stats on just about every aspect of the market, and significantly more historical data than we do. I'm interested in the comparison to Seattle, because they are similar in many ways to us, did not suffer from widespread subprime loans, have a strong economy, and a very long history of the "stairstep" in housing prices, where prices would increase sharply, then stay nominally flat, then increase sharply again. The VREB only supplies average prices, while the data for Seattle is medians, so you cannot directly compare prices. The goal of this graph is only to examine price trends. 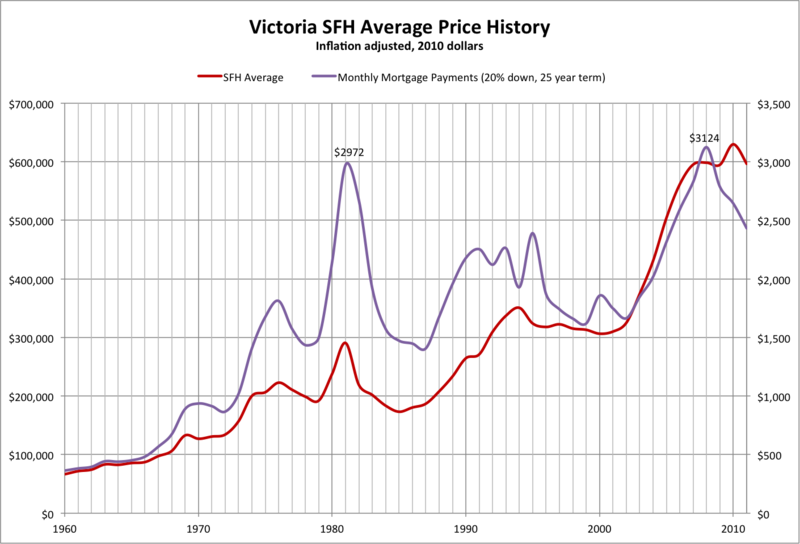 Data for Victoria only goes back to 1960 and I have not been able to find a source for anything earlier. If anyone knows if this data is available, we could complete the picture. 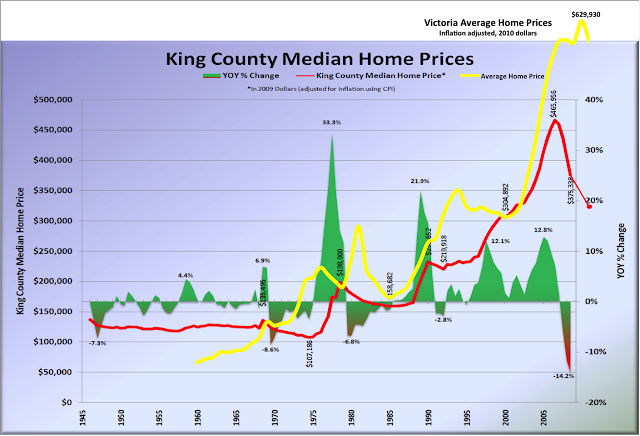 Prices in Seattle were flat or declining from the start of the data until the mid 1970s. Tim's theory is that this is when Seattle made the transition from small town to real city. Population data shows that Seattle proper was reaching close to the same numbers it supports today, possibly indicating that land constraints started pushing on prices around that time (with subsequent growth mainly in outer areas). 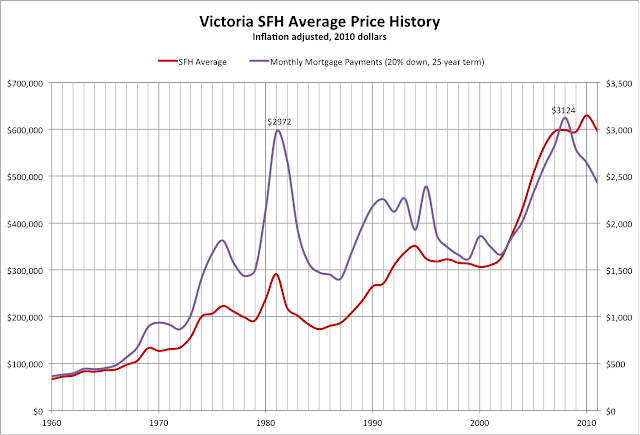 Victoria does not show this flat area, with quite strong price appreciation all the way back to 1960 (because we are even more land constrained?). Clearly there must be a flattening out if you keep going back, but the data is insufficient. Even long term stair steppers eventually stumble. Seattle had a 30 year history of increases and flat periods, and like here, the prevailing wisdom was that prices there would never experience a crash. The big crashes (and in fact bubbles in general) tend to be steep and symmetrical (Victoria in 1981, Seattle in 2007). Does the fact that we have sustained the peak prices for 4 years mean that the government has in fact engineered a soft landing by crashing interest rates? Of course, the big missing piece of data here is interest rates. People tend to be more concerned about their monthly payment rather than the absolute price of the house. So let's have a look at that. Now we see a more symmetrical decline. If you believe that historical data has any predictive value at all, you could extrapolate that if rates stay as low as they are, and the monthly payment curve continues on its symmetrical decline, you would expect average prices to decline to $450,000-$500,000 in 3 years. The next step would be to factor in local income, and the effect of changing CMHC regulations, but I'll leave that discussion for another post. I think at this point we can just start posting last year's numbers instead of updates and call it close enough! However the averages are stubbornly high, with high end properties reportedly selling well (after some price cuts perhaps?). Marko reports the SFH average at $652K, while condo average is $331K. Eight hundred fifty eight dollars and twenty-nine cents. Sounds like almost enough to buy a flat screen TV on sale doesn't it? It's also about enough to make a monthly lease payment on a new hybrid SUV if that's your desire. It also happens to be BC's average weekly earnings. Surprised? I am. When you double that, you get $89,262.16. That'll qualify you for a 30-year mortgage of almost $485,000 at 3.2% provided you have no other debt and $20,000 to put down. The mortgage payment eats up $2,000 per month of your pre-tax $6,866.32 average household income (I've just doubled the average weekly earnings, this isn't a real number). This income will typically be hit by a 30%+ income tax rate or so, but I'll round it down to 30% to keep the math easy. After income-tax income is around $4,800 per month. Which means the bank is qualifying you at almost 42% mortgage to after tax income for your shelter debt costs alone. Add taxes, maintenance and utilities, and you're definitely above 50% of your available cash going to the roof above your head. Prudent lending? I'm left hoping that people are smart enough not to put themselves in this position. Unfortunately, the debt data doesn't support my hope. Sales are off to a bit of a jump start in May; perhaps a good weather bounce anyway; with nearly 24 unit sales per day thus far. If this pace keeps up, we're looking at over 700 sales on the month, about 20 per cent higher than last year. I wonder why?